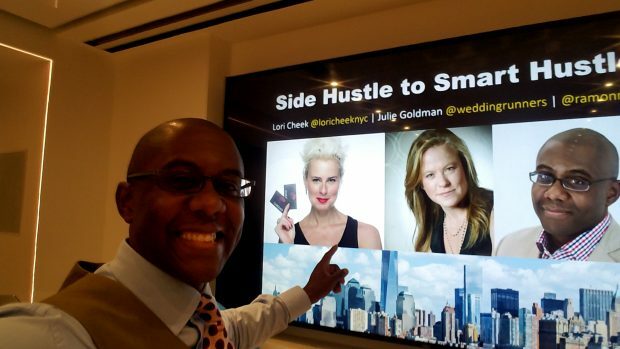 At the Side Hustle to Smart Hustle event held at the Microsoft flagship store in New York City, businesses owners had the opportunity to get help from Julie Goldman, Original Runner Company and Lori Cheek, of Cheekd both entrepreneurs who have appeared on Shark Tank. One of the attendees at the event has a clothing line made especially for those with diabetes, it has a panel to enable the arm to be exposed while keeping the rest of the body warm. Julie suggested that the name of the clothing line might not resonate with what it represents. The panelists and the attendees suggested that the designer consider labeling her fashion line with something more in sync with what the line represents. Another attendee struggled with getting hundreds of her celebrity fans to share her not-for-profit business with others. Her business is a curriculum for students, which integrates celebrities and notable persons and her challenge is raising funds for it. The advice she received was - ASK. If you don't ASK you won't get. Below is a short video of Side Hustle to Smart Hustle, hosted at the Microsoft Store in NYC. Register for the 13th Annual Smart Hustle Small Business Conference with Seth Godin and Gary Vaynerchuk's Chief Heart Office, Claude Silver!